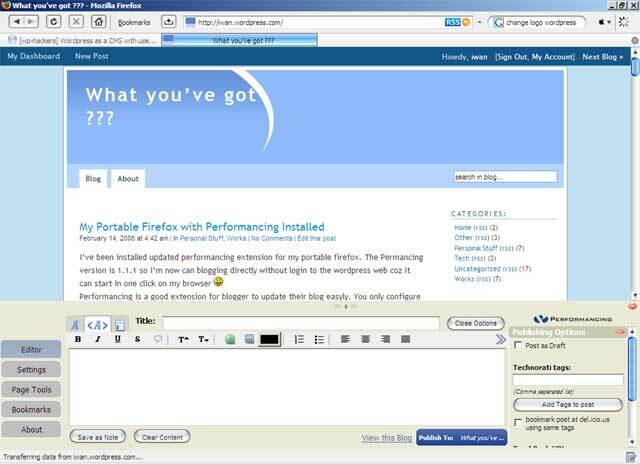 Performancing is a good extension for blogger to update their blog easyly. You only configure the account wizard for first time run and you can add your tag at your Techonorati Account directly from your blog. Today, i actually goes to Solo City and Pekalongan City. I goes there because we have a job to that city. But it’s delayed because something that cause it become delayed. If not delayed we’ll go today from Jakarta Train Station Gambir’s this night. Maybe we’ll go in next 2 or 3 days by train. At 7th February 2006. I’ve bought new motorcycle from mr. Sadeli from Pamulang. This motor have deal since one week ago. But he need more times to find new motor. He want to buy a new Yamaha Jupiter MX 135. I need this motor for exploring to Office and Customer, and operational things. The motor type is “Supra X 110” this motor come with 110 CC and with disc brake. This is not new motor but still in good condition. The odometer show “4800” km. It means this motor doesnt recently used by him. The body in good condition and engine doesnt have a problem. When i borrow this motor i ride it from Pamulang to Kebun Jeruk Jakarta. The distance is about 35 Km and it takes about 40 minutes. The ride style is enjoy and softly. The things that i like is the fuel indicator is move about 2 mm from Pamulang to Kebun Jeruk. Hehe. From him i also bought his helm. His helm is diferent than helm that is made from Indonesia or Thailand, its made from Singapore and it’s have a safety certificate. In head its more comfortable than usual helm. Yesterday, while i’m surfing the internet, i’ve found the a small song from the game that i love while i’m a kid. It’s final fantasy. I’m really like it because this game is beautiful the game, scene, sound, character and the FMV. Till today i’m still using the final fantasy theme for my desk work.